In 1975, Paul was a carpenter and Georgean was a data processor. We had been married for five years, were hand-building our own house in the hills northwest of Austin, Texas and were looking for a way to start "Living the Good Life" we had read about in the columns written by Scott and Helen Nearing in the Mother Earth News. 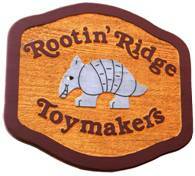 We rented an 8' x 20' space in a craft mall, quit our "real jobs" and started making wooden toys. Our opening day was appropriately April Fool's Day, 1975. By the end of the month, we had sold $150 worth of our original hand-crafted designs. No one was impressed but us -- but that was all that mattered. In 1976 we made our one and only expansion when we moved to an "expansive" location of 442 square feet where we hand-crafted wooden toy, games , puzzles, musical instruments and many other unique and wonderful items for more than 40 years. On December 12, 2015, we closed the door of our “bricks and mortar” store for the last time. HOWEVER! We continue to manufacture personalized step stools, name puzzles, name trains and unit block sets in our Central Texas Hill Country workshop. These items may be ordered in our online store.